Every domainer has their own process to appraise and market domain names for sale. Few domainers are willing to share their tested secrets. But Chris Goh is not a regular domainer. Some would even call him unorthodox. If you are in need of help getting targeted traffic to your domain names so you can support a “buy this domain name now” call to action, then Chris Goh, Creative CEO of BullShitWebsites.com, has some unorthodox tactics you may want to try. These three creative tactics may not be right for you, but they may get you thinking creatively. If you happen to work for one of the tech companies in Redmond, Washington, you may have noticed Chris driving his pickup truck through the streets right around the end of the business day… and seen two of his domains on the back window: GoodKarmaToYou.com and BullShitWebsites.com. This reflects one of Goh’s unorthodox rules for raising awareness of domain names: “Always be marketing. You never know who’s looking.” Goh also wears t-shirts with domain names, and hands out free t-shirts at community events. Oh, and he’s not above a little graffiti now and then. Goh got into the domaining business not long after getting laid off in 2001 – for “not being creative enough,” he mentions ironically. Since then, he’s used a number of original practices to keep his domain business dynamic. One of this favorite unorthodox domaining tactics is to use free eBay listings. “I had this idea some time ago, but didn’t do anything about it until I started getting coupons from eBay for free 7-day listings. So I started listing outrageous offers that would draw anyone with a bone of curiosity to check it out,” says Goh. 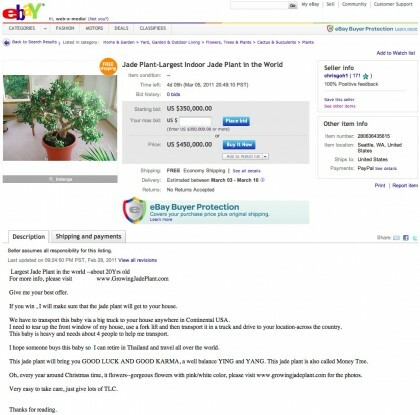 Right now, you can buy “the biggest jade in the world” for a mere $350,000 or a set of domain names related to home health care for $888,000. The other domain owner wanted $150,000, but wasn’t really interested in selling because he was going to build an online gambling site in hopes that states like New Jersey will soon approve on-line gambling. Knowing this information not only help Goh set a value on the domain name he owned, but he could point out to the potential purchaser that having a plural version of an active domain would help drive traffic to the domain that Goh currently owned. “You have to crosscheck what your competitors are doing,” says Goh. Having reading this article I realize it was helpful in so many ways. Genius! ‘Creative’ isn’t the right word. Spammer is. Don’t take lessons from this guy. Standing out for standing out’s sake is nonsense if you’re truly a business person. @Shane: Very original and creative. Well done. Any ideas that you can share around marketing a domain name for sale? GTG–time for my smoke. Now pass the peace pipe. AJ, two that come to mind that worked well. I bought an iPad on the first day available, broke it and sold the “First ever broken iPad” on ebay. Type in first broken ipad on google. Made my money back and got links and great traffic. Well worth the money. Bought a box truck and had a huge billboard sized sign plastered on the side. Had an employee sit in our competitors parking lot every spring weekend. That or just drive around near it. Billboards cost $3000 a month here and I can drive around a lot of weekends for that price. People say they see that truck “everywhere” when in reality I just target competitors and busy locations. I have plenty more. I have to be creative to save money in advertising. One thing I don’t do is spam people relentlessly which seems to be the case here based on the comments so far. I find the ebay auction to be a great idea and a funny way to promote. I can say I have visited websites mentioned in high priced ebay auctions before. Cool article. I wouldn’t count out the .us. While the .us will not sell as quickly as .com, the extension can make a decent profit. I managed to sell a job .us for a nice sum this past summer. I received a fair offer because I put a price and a make offer. The sale produced additional sales. Sedo’s price suggestion and fixed price recommendation would have cost me a sale. I know about insults. There are many domainers, including one name I noticed in a post, that tend to insult others. You can’t take insults, criticism, and unprofessional treatment to heart. I find a few blogs where the owner will make comments to entertain their fans. In any case, being original will find you fans. Maybe not always original, but I think the creative moniker fits. I too, do not plan to follow his example, but I don’t follow many others either. BTW, from what I hear, Mr. Goh generaly does not break any laws with his marketing. While I at first thought he might, I later discovered that things are not always what they appear to be. Sometimes that’s a great thing in marketing. As for the BS guru — He spammed me few times randomly within the last 30 days, so I had to report the e-mails and websites being promoted/spammed to his ISP and web host. Very simple. @Shane and Mark If you cannot accept negative comments, then you are sugar coating your blogs. I wrote a comment at LMorgan after he made a 5K sale saying that Finally he woke up that dot com is KING. So what took you so long to realize that? Finally, he admitted that it is easier to sell a dot com domain. He won’t dare to post that comment. In every blog ,Dot com is KING, so why are you domainers promoting other extensions? @Shane: If you don’t think that these tactics are not creative (I do, but I would never do them myself), what do you do? Not everyone likes to be criticized when it’s served with a side of self-promotion…:-) But comments don’t have to be approved, do they? Lastly, professionaldealers.com already has great potential due to the large number of people that are or want to be pros. I see gambing shows on all the time it seems so I think there is already a market for a site like that. BullShitWebsites inc stock has gone up in value. We are always hiring, not just ordinary folks, folks who are CREATIVE but on the other hand, if you are creative, then you won’t be working for anyone except for yourself. @Mark— I guess you cannot handle constructive criticisms.. This guy randomly insults my articles and domains via comments and email with a link to his site. I don’t see him recommending that tactic here. Unorthodox isn’t the first word prefixed with un that comes to mind. Chris Goh is my new hero. Gorilla marketing at it’s finest.